In 2012, School 21 in Stratford, East London opened its doors. Recognising the value of developing student’s speaking skills to support them in learning and in life, the school places talk at the heart of every lesson and nurtures a whole-school culture of oracy. Teachers and students have found that that this talk-centred approach has a pronounced effect on achievement across the curriculum as well as enhancing pupil’s eloquence, confidence and wellbeing. ​In 2014 supported by the Education Endowment Fund, the School 21 Trust worked with Cambridge University to develop an oracy curriculum and assessment tools to be shared with schools across the country (read the project findings report). 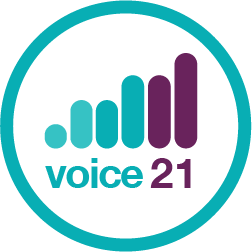 With the backing of the Big Change Charitable Trust, Voice 21 was born. ​Now that we are confident that prioritising oracy has a transformational effect on students we want to spread our ideas in order to bring about change. Voice 21 is all about inspiring a community of educators who are committed to amplifying oracy in our education system.